aem = fine-structure constant = 1/137.036001 . . .
. . . to arrive at the Feigenbaum delta constant, one must subtract the radian from the Cheops face angle. This is interesting because now the direct connection can be shown as a simple subtraction of the radian...180/pi.. from the face angle, which suggests dimensionlessness. (( radian - 51.849982814 ) ^ ( 1/4 )) + Pi = Fd = 4.669212726 . . .
. . . taking the Cheops face angle directly to 1/Pi power results in the strange connection to the Hebrew 32 paths of wisdom or the Hindu 32 smokes of the reality. THE SIGNIFICANCE OF THE GREAT PYRAMID'S SIDE ANGLE. Figure 4: The few solitary casing stones at the bottom of the Great Pyramid. These too would have been removed were it not for the good fortune that they were covered in tons of sand and inaccessible to those who plundered the Pyramid's stone to build the city of Cairo. 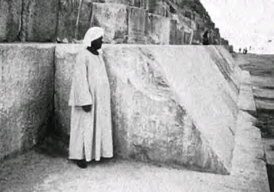 These beautiful white limestone casing stones once sheathed the entirety of the Great Pyramid on every face, all the way up to its 44' X 44' flat floor altar on the top of the pyramid. There are various degree angles given, all in the vicinity of 51.85 degrees, which different scientists have determined represent the intended, finite angle of the Great Pyramid. Because of the weather worn and sand lashed condition of these limestone sheathed surfaces, the exact degree angle will never be resolved, definitively, by averaging the damaged angles of the casing stones themselves. We do, however, know that the architects were aiming for a figure around 51.85 degrees. Happily, the true figure can easily be identified mathematically, as there is only one plausible possibility. 2. The number 51.84 is an exact fraction of 25920, the anciently used number that described, in years, the duration of the Precession of the Equinoxes for a complete circuit (51.84 X 500 = 25920). 3. The angle, 51.84 degrees, divided by 2 = 25.92...again coding the appropriate numbers related to the Precession of the Equinoxes. 4. It has been determined, through comparative analysis, that the ancient reed measurement was 10.5 feet or 126 inches. Therefore, given that the true length of the Great Pyramid was 756 feet, which equates to 72 reeds per side, the total area that the pyramid covers is 72 X 72 reeds or 5184 square reeds. 5. It will be shown that the Heel stone at Stonehenge resides 259.20 feet from the exact centre of the site to the outlying face of the stone, The azimuth angle from site centre to the south-western extremity face of the stone was intended to convey 51.84 degrees off North. Figure 5: A drawing of a surviving casing stone as per the close proximity dimensions given by W. F. Petrie. 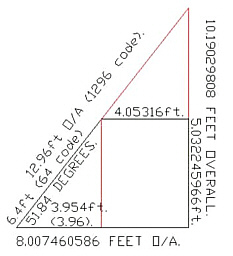 The extended lines (red) indicate the probable geometric coding that the architects wished to demonstrate in a block, 8' X 12' of base measure and having a rear height of essentially 5 feet. The 6.4 feet of diagonal face alludes to the very important "64" code. If the block were allowed to run to a point where the face diagonal intersected with the rear vertical line, then the distance covered would be 12.96 feet. This number is a very important code of antiquity that relates to the duration of the Precession of the Equinoxes . . . 25920 years / 2 = 12960 years.
. . . end of article . . . Discovered 4-19-05 . . . Concerning the 44 foot by 44 foot altar floor at the top of the pyramid, this equation was noted: e = natural log = 2.718281828 . . . According to Kabbalah, there are 72 Divine Names. It may also be significant that 4 x 72 = 288, and that 82944 / 72 = 1152, "Witness."